Since the passage of the Affordable Care Act, interest in private health care exchanges has exploded. Private exchanges have been coined a “game changer” in the employee benefits space, and they remain one of the hottest topics when discussing employee benefits. Private exchanges are described as the “optimum or quintessential solution” – sophisticated, turnkey technology, which will help employers save money, ease HR and administrative burdens and create happy employees and retirees! Each private exchange boasts that they can help employers control costs and promote health care consumerism with a one-stop shopping experience, turning benefits selection into a retail shopping experience. So if private exchanges offer so much value to an employer’s benefit strategy, why aren’t more of them lining up? The reality is that the private exchange market is still in its infancy, and there are still a lot of unknowns. 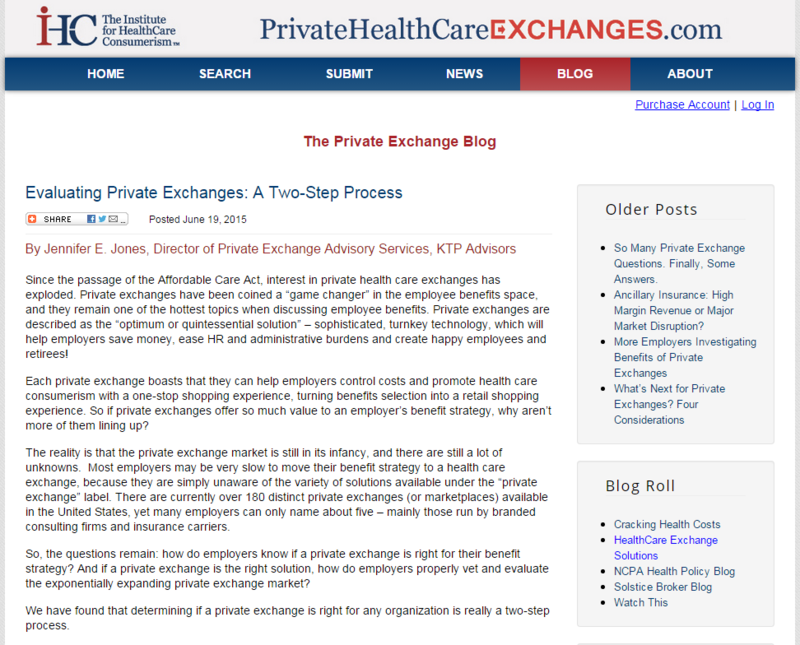 Most employers may be very slow to move their benefit strategy to a health care exchange, because they are simply unaware of the variety of solutions available under the “private exchange” label. There are currently over 180 distinct private exchanges (or marketplaces) available in the United States, yet many employers can only name about five – mainly those run by branded consulting firms and insurance carriers. So, the questions remain: how do employers know if a private exchange is right for their benefit strategy? And if a private exchange is the right solution, how do employers properly vet and evaluate the exponentially expanding private exchange market? We have found that determining if a private exchange is right for any organization is really a two-step process. First, an employer needs to decide what they hope to accomplish by moving to an exchange. By reflecting on their own structure and strategy around employee benefits and determining what they want to accomplish by moving to an exchange will streamline the decision-making process. Understanding your needs as an employer is critical to be able to evaluate an exchange offering. Time spent upfront to understand your goals could help to eliminate a lot of mismatched vendors from consideration. The second step is vetting and evaluating the different exchanges based on the employer’s specific strategy, structure and budget. To properly evaluate all the players in the private health insurance exchange market, it is important to get an independent perspective and know the right questions to ask. To find out more including the essential questions to ask and why their important, read the full article here. Next PostNext Will We See You In Chicago?